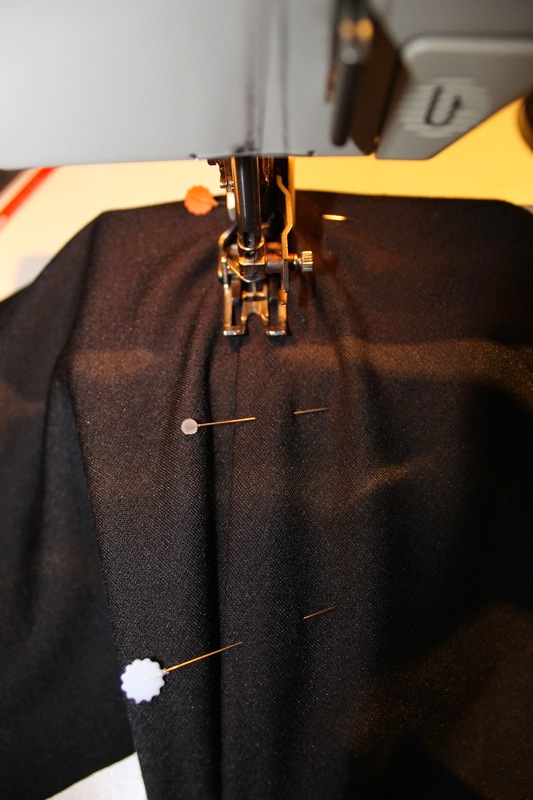 So, you saw my ponte pants and want to make some of your own? You will need approximately 1 metre of ponte fabric, a leggings pattern* and a printout of my additional pattern pieces for the quilting and knee detail (download free here). 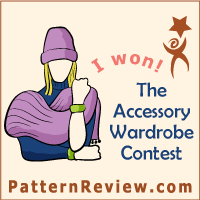 *I used the Megan Nielsen Virginia leggings pattern and modified it as described below. 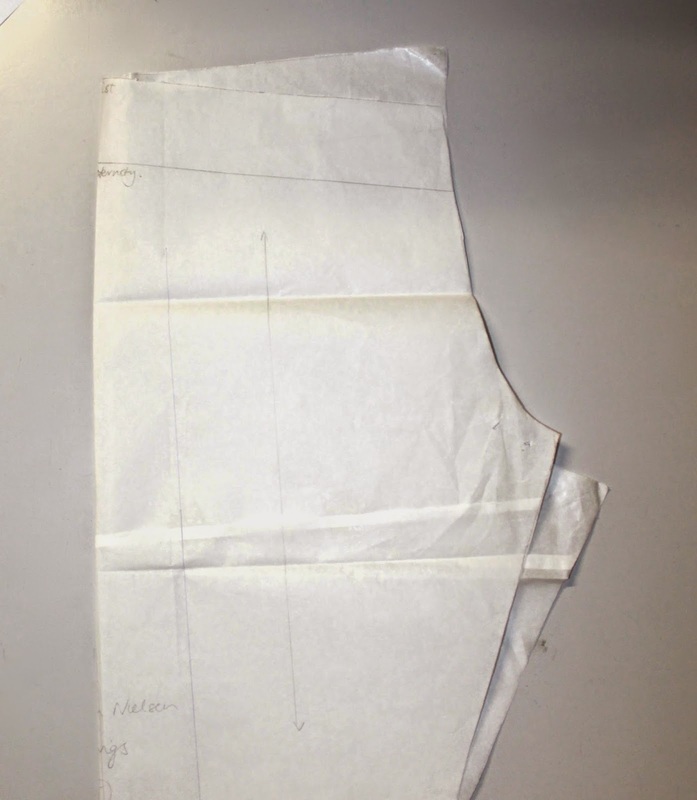 You can use your own leggings pattern or make one by tracing a pair of leggings (remember to add seam allowances). The Virginia leggings pattern has no side seams. You need to create some by folding the pattern in half lengthwise (see below) so the two crotch curves match up as closely as possible. 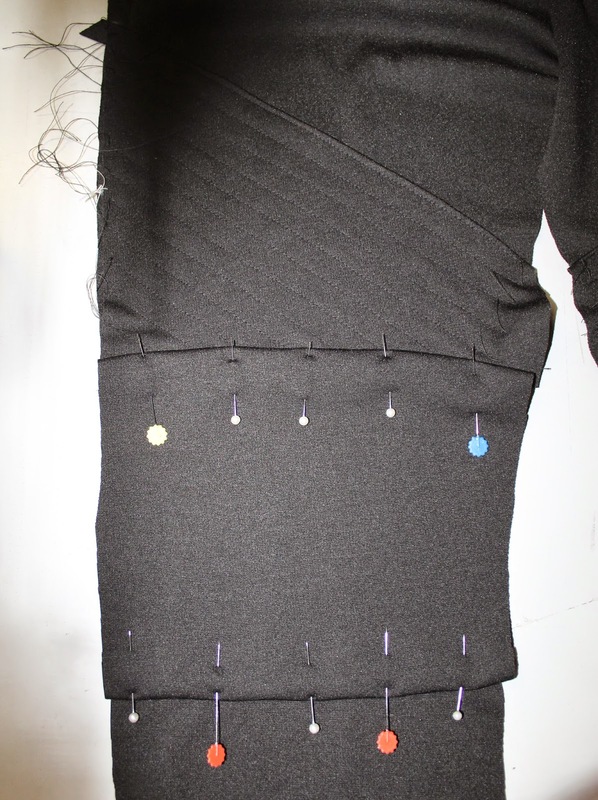 Open out again and trace separate front and back pieces using the fold line as the new side seam. Don't cut it out yet. 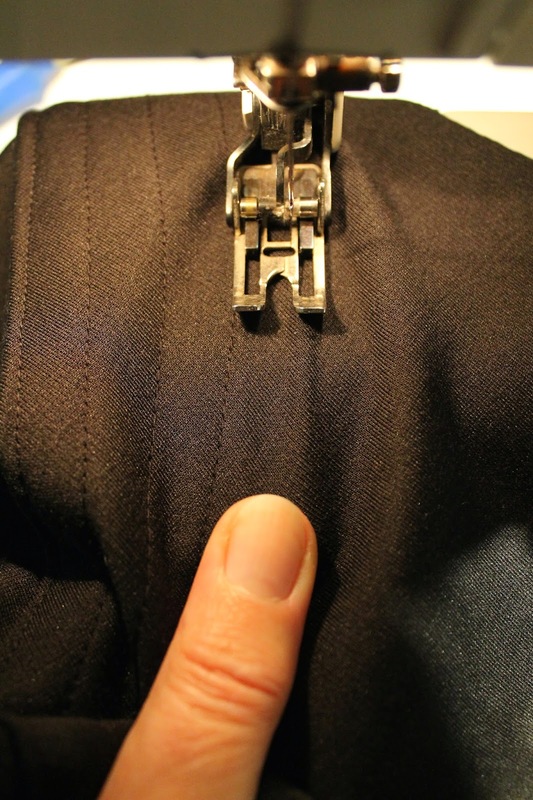 Next you need to add at least 1.5cm all the way down each of the long leg seams (inside and outside leg). This is because ponte knit doesn't have the same amount of stretch as leggings fabric. Larger sizes may need to add more leg width. Check your printed knee and quilted pieces against your leggings pattern. Add width if necessary to match your leggings width. Cut out all your pattern pieces, including the printed ponte pants pieces, from ponte fabric that has been folded with selvedges together. Take note of grainlines and direction of greatest stretch. 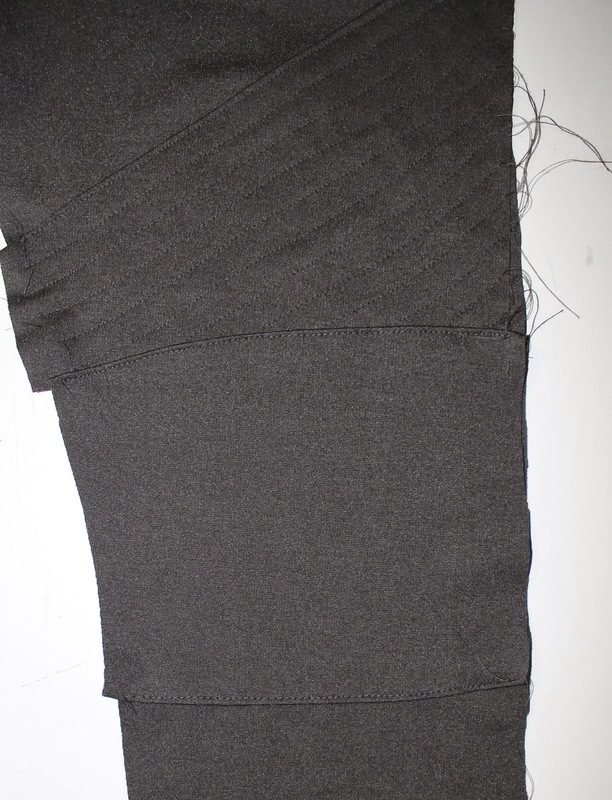 With the two front pieces right side together sew the crotch seam using an overlocker, zig zag or other stretch stitch. Repeat for the two back pieces. 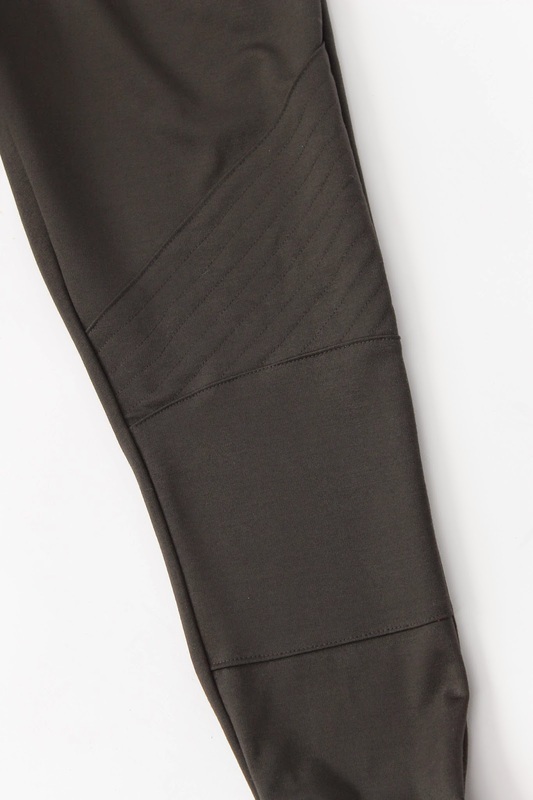 Mark the placement of the quilted piece on your front leggings pieces. Mine is marked in white chalk 27cm from the top of the side seam. Adjust yours as necessary depending on your size. Hold them up against your legs to check placement. Fold over the top 1cm of the quilting piece and place it on the leggings front piece level with the chalk mark you just made. Pin in place. Topstitch along the top edge of the quilting piece. I chose to use a straight stitch and stretch the fabric as I sewed so the resulting seam has some stretch. You could used a triple stretch stitch instead but I find it to be less neat than a straight stitch. You can see the seam being stretched as it is sewn below. Using your sewing foot as a guide, stitch quilting lines through the two fabric layers all the way down the quilting piece. Remember to stretch as you sew. I moved my needle to the right to get stitching lines approximately 1cm apart. This is the finished quilting. Don't worry if the sides are a bit uneven. Fold the edges of the knee pieces over by 1cm and place them so they overlap the quilting pieces by 1cm. Pin in place. Topstitch along the top and bottom edges of the knee piece, stretching as you sew. If you fancy pockets, add them to the back leggings pieces now. I used the pockets and placement from my Jamie jeans pattern and topstitched them in place. If you don't have a jeans pattern, use a pair of jeans as a guide. Trim any excess fabric from the edges of your quilted and knee pieces then sew your leggings together with an overlocker or stretch stitch. I like to sew the inside leg seam first, matching the crotch seams, then the outside leg seams. Add the waistband, hem the lower edge and you're done. Thanks. They are so comfortable I want to wear them every day. These are hot! Thanks for the tutorial! It's been ages since I did a tutorial. This is simple sewing, but a few people I know are starting to sew so I hope it's useful for someone! If you need to buy essay writing service to help you with your papers. Thanks for the article, by the way. There are more to read if you follow the link and look through the blog. If you do not understand, we will apply directly to CallCenter. Company is one of the leading Company in Nagpur, India. At Padmesh Gupta.Nagpur Mining Company we have dependable captivated everyone – both in the way it conducts business and in the standards it needs. Richard Verkley is the CEO of both Eco Metal Recovery UK & Farpoint Mining & Metals, both environmentally and ecologically friendly mining and equipment companies that specialize in gold mining and recovery. Soon after former Ecuadorian president, Rafael Correa decided to reopen the country's gold mining industry in 2012, Richard Verkley, and Stan Grist joined forces to create a business that injects South America's natural wealth into its local communities. Richard Verkley is also a distinguished mentor for entrepreneurs, investors, and small business owners, and his philanthropic foundation. For more info on Richard Verkley visit http://markets.post-gazette.com/postgazette/news/read/36230748. Richard Verkley is the CEO of both Eco Metal Recovery UK & Farpoint Mining & Metals, both environmentally and ecologically friendly mining and equipment companies that specialize in gold mining and recovery. Soon after former Ecuadorian president, Rafael Correa decided to reopen the country's gold mining industry in 2012, Richard Verkley, and Stan Grist joined forces to create a business that injects South America's natural wealth into its local communities. Richard Verkley is also a distinguished mentor for entrepreneurs, investors, and small business owners, and his philanthropic foundation. For more info on Richard Verkley visit https://www.nasdaq.com/press-release/richard-verkley--on-how-blockchain-can-ensure-the-security-of-gold-investments-20180425-01135.